Jarir “Bookstore” has announced the availablity of the iPhone 4 in their showrooms at limited quantities. It comes with a free car charger that you have to ask for. Jarir did not include prices so I had to go and see it with my own eyes. The prices are 5,499SR for iPhone 4 with 32GB storage and 4,599SR for the 16GB one! The unit is from the UK based on the box size and charger. We reported that the price of the 32GB iPhone 4 from Apple is less than 3,500SR! Save yourself 2,000SR and do not buy it from Jarir. Either buy it directly from Apple in the UK and ship using Aramex or wait for the official release from Mobily as their price will not be higher than 3,000SR! I warned about Jarir before, I do not recommend buying the iPhone from them. I know that the Jarir Book Store is a Killer & when ever I see their Special offers on Apple products the price is all wise high/up. As you mentioned on this post, it’s batter to buy it from UK. i hope mobily release the new iphone 4 soon..i want to buy coz i will be leaving ksa soon..
the problem now is that everyone is waiting for Mobily & STC’s release. I’m afraid there wont be enough iPhones. And you’ll have to wait AGAIN!!! I just agree with you.. there won’t be much stock to satisfy all the buyers. jarir is not fair with the price.. people here in saudi should not patronize that kind of marketing strategy.. they take advantage of the situation, since iphone 4 is not yet available in market.. When is mobily getting the iphone 4?? Will the iphone 4 from mobily going to be the same price as jarir??? 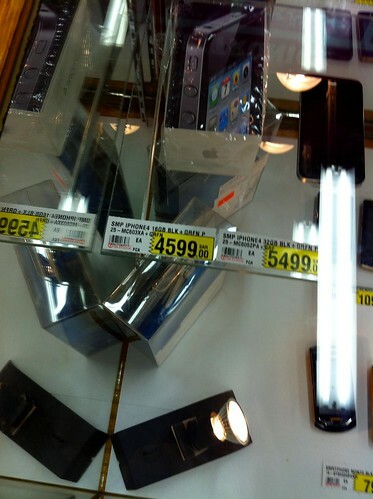 I went to Jarir last night and found iPhone 4 at tagged price SR5499. They guy was boosting about selling so many sets at this price mentioning the huge demand. I doubt, we’d be able to have iPhone4 at lower price from Mobily and STC even after official release. Behind the curtains, local mobile-shop owners will just buy as many as they can to keep the prices high. The ‘good’ news here is that they’re bundling the iphone 4 with Apple’s bumpers. Maybe this is what’s causing the delay. Not enough bumpers to be shipped with the iphones headed to Mobily! The ‘good’ news here is that they’re bundling the iphone 4 with Apple’s bumper. Maybe this is what’s causing the delay. Not enough bumpers to be shipped with the iphones headed to Mobily! iPhone 4 is here in stc. but its also overpriced the 16 gb is 4200SR!!! relax everyone, if other stores are selling iphone 4 at a high price, then let the ones with more money buy them. we will wait for mobily, by then the rich ones must have bought it from the other stores, so we wont have to struggle or wait too much. locked to AT&T. We all know how to unlock it now. even if its factory unlocked, u still need a jailbreak! USA iPhone 4 is not Factory Unlocked. I suggest not to waste money on Locked iPhones. buying iPhone with that price is madnessUnfortunately, there are many people who do not see the true picture of manipulation of the shops.All this because they want to get it quickly. And not interested in what effect this ugly movement. Does Abu Jahl still lives in our blood???????? The matter’s that people wana buy iphone 4 as soon as possible so when Jarir announced, they should sell them by overpriced because no one sells iphone 4 before them in Saudi Arabia. guys u should wait , hold on until the price decreases. AA, i am planning to get iphone 4 unlocked from canada through some relative but i heard that its not working in saudi.if someone is already tried & tested.please confirm with thanks. If the iPhone 4 from Canada was purchased from Apple store as an unlocked phone then there should be no problem using it in Saudia. Make sure iPhone 4 was purchased as “buy out right” with full price in Canada directly from Apple store and is not locked with any carrier (Rogers, Fido, bell or Telus). UK Apple Stores sell contract-free iPhones which make these stores a lucrative target for brokers who buy the iPhones for Â£499 (SR2930) and Â£599 (SR3509) and sell them for vastly inflated profits to customers in Eastern Europe, the Middle East and Asia where the iPhone is not yet on sale. no. but jacking up the price to almost double? that I did not expect. Hey, I bought my iPhone with Aramex from Apple UK, but I found a fault in it, it makes a buzzing noise when in the earpiece when I make a call. I tried restoring and swaping sims but didn’t work. Can I get it exchanged from Jarir since its still unber warranty and is registered with Applecare till 2012? Thanks for the reply, should I tell them that I got it from the UK or just tell them I got it from Jarir? I think you guys are not being fair.Prices of the IPhone is the same everywhrere in Saudi Arabia. Mobily is advertising low prices but try to get one if you can. (if you are non SAUDI) its impossible.LAw of supply and demand states that prices go up when availabilty is low and demand is high.Cost of the iphone is high thus the selling price is also high.Anyway who are we to tell people whether to buy or not.Prices are clearly indicated in the display.to buy or not to buy if the buyers choice not ours……..